Apple HD 5870 Graphics Upgrade Kit for Mac Pro The ATI Radeon HD 5870 includes 1GB of GDDR5 memory, uses the PCI Express 2.0 interface, and includes two Mini Display Ports and one dual-link DVI port. For amazing graphics processing power, the ATI Radeon HD 5870 with 1GB of GDDR5 memory is an ideal choice for visual creative, scientific, and technical applications. Features: ATI Radeon HD 5870 includes three video ports: two Mini Display Ports and one dual-link DVI port. This allows you to connect the 24-inch Apple LED Cinema Display plus another Mini Display Port-based display, and a DVI-based display such as the 30-inch Apple Cinema HD Display. 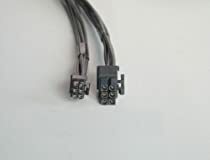 Display adapters are available to connect VGA displays. Compatibility: Requires MacPro (Mid 2010 with 1333MHz DDR3 memory) or Mac Pro (Early 2009 with 1066MHz DDR3 memory) with PCI Express 2.0 slot, Mac OS X v10.6.4 or later. The ATI Radeon HD 5870 includes 1GB of GDDR5 memory, uses the PCI Express 2.0 interface, and includes two Mini DisplayPorts and one dual-link DVI port. Despite Apple insisting that this card does not work with the 2008 Mac Pro (MacPro 3,1) I decided to take a chance and order the card because the machine meets all of the required hardware specifications. I looked at the actual technical requirements like slot type and power availability based on the AMD/ATI information, not just what Apple officially publishes. I put the card into the machine and it works great. I ran a simple OpenCL ray tracing application and was very pleased by the performance. One thing that is not explicitly made clear without research is that the card requires two 6-pin power connections. 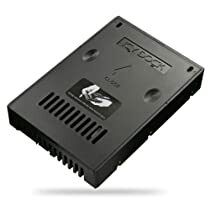 As such, it is not possible to install more than one of these cards in your computer, at least on the model I have, however the instructions indicate that the situation may be the same for the 2009 and 2010 models that this card is advertised for. Also, the card I received looks like the card that is under the smaller one as shown in the picture. It is around 12 inches long and will span the entire length of the PCI bay. For nontechnical people, these are double-wide cards and you should probably install the card in slot one, the lowest slot, if you need to use the other PCIe slots as it will cover the adjacent slot if installed in slot two or three. It will not work in slot four, the uppermost slot, because of its size. For those of you with older Mac Pro's, there are reports that this card or the Radeon HD 5770 may work in the 2006 and 2007 models as well (the 1,1 and the 2,1 respectively). Was a major upgrade for my 2009 Mac Pro 4,1 replacing the original stock nvdia 120 card. Took extra research to find this one as the 5770 was a much more popular (affordable) upgrade for the tower. However, the 5870 is quieter and seems to generate less heat than it's predecessor. My card was refurbished but done so in a way as to almost appear new. My tower was a little sluggish after the upgrade from Snow Leopard to El Capitan, the 5870 along with RAM upgrade returned that responsive snappier feel I was used to. I just received and installed the card on my MacPro early 2008. The upper port does not work, but the lower port works. I plugged in two separate displays and the top display port simply does not work. I changed wires, switched displays, removed and reinstalled the card several times and there are no permutations under which the upper display port will work. The bottom of the card has a mini DVI port as well. So, currently, I have one display plugged into the lower port and the second display plugged into the lower mini DVI port. Both displays seem to be working fine. I haven't put it though its Photoshop paces yet, but I don't know if because both displays are plugged into the lower ports on the card that I'm not able to use 100% of the cards capacity. Any thoughts?